We did this in the iPhone 5 review, so I thought I'd continue the trend here. 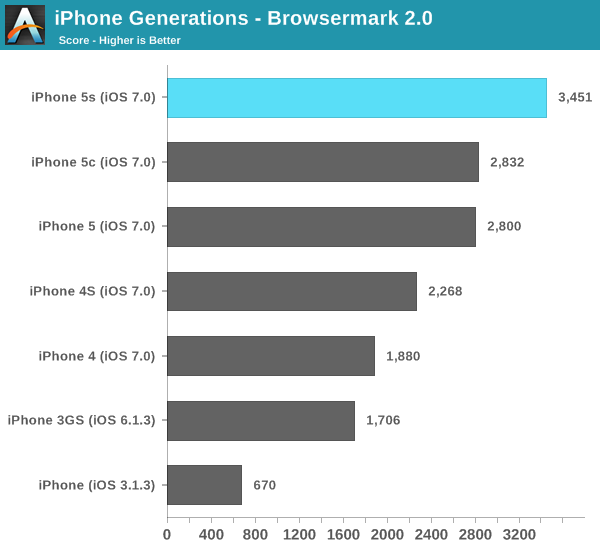 For those users who have no desire to leave iOS and are looking to find the best time to upgrade, these charts offer a unique historical look at iPhone performance over the generations. I included almost all iPhone revisions here, the sole exception being the iPhone 3G which I couldn't seem to find. All of the devices were updated to the latest supported version of iOS. That's iOS 7 for the iPhone 4 and later, iOS 6.1.3 for the iPhone 3GS and iOS 3.1.3 for the original iPhone. 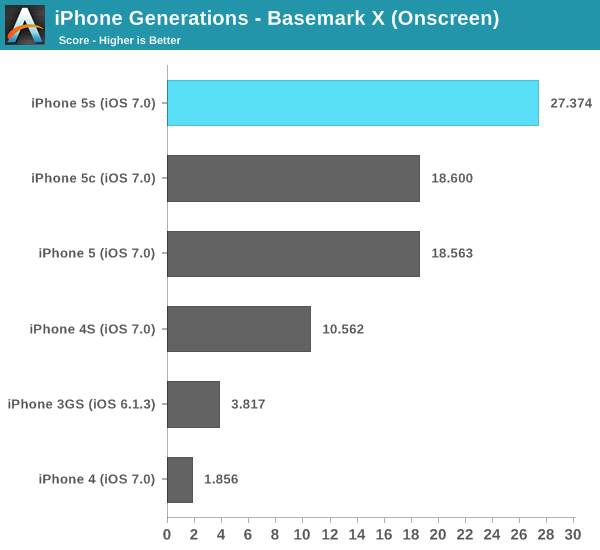 Performance improved by a factor of 100x compared to the original iPhone. You can cut that in half if the iPhone could run iOS 4. Needless to say, Apple's CPU performance estimates aren't unreasonable. We've come a long way since the days when ARM11 cores were good enough. Even compared to a relatively modern phone like the iPhone 4, the jump to a 5s is huge. The gap isn't quite at the level of an order of magnitude, but it's quickly approaching it. Using the single core iPhone 4 under iOS 7 just feels incredibly slow. Starting with the 4S things get a lot better, but I'd say the iPhone 4 is at the point now where it's starting to feel too slow even for normal consumers (at least with iOS 7 installed). Browsermark 2.0 gives us a good indication of less CPU bound performance gains. Here we see over a 5x increase in performance compared to the original iPhone, and an 83% increase compared to the iPhone 4. I wanted to have a closer look at raw CPU performance so I turned to Geekbench 3. 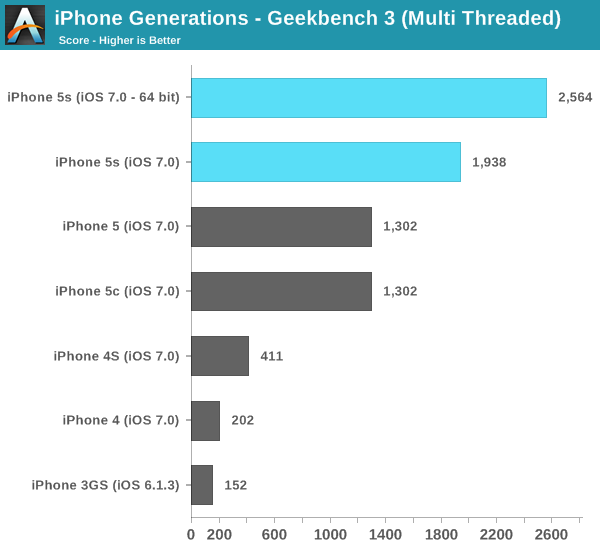 Unfortunately Geekbench 3 won't run on anything older than iOS 6, so the original iPhone bows out of this test. 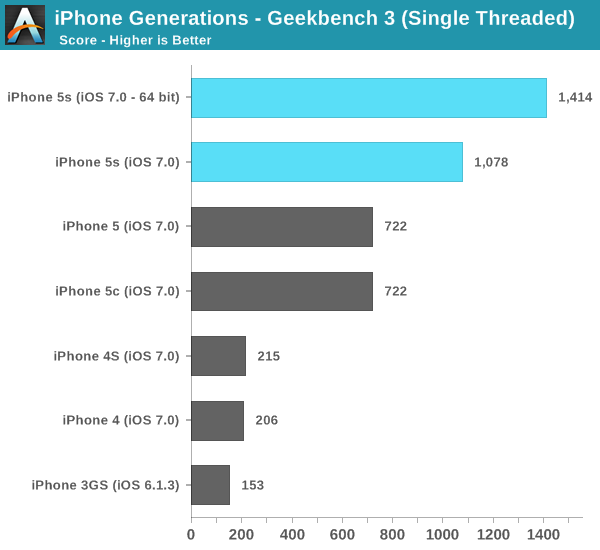 Single threaded performance scaled by roughly 9x from the 3GS to the iPhone 5s. The improvement since the iPhone 4/4S days is around 6.5x. Single threaded performance often influences snappiness and UI speed/feel, so it's definitely an important vector to scale across. 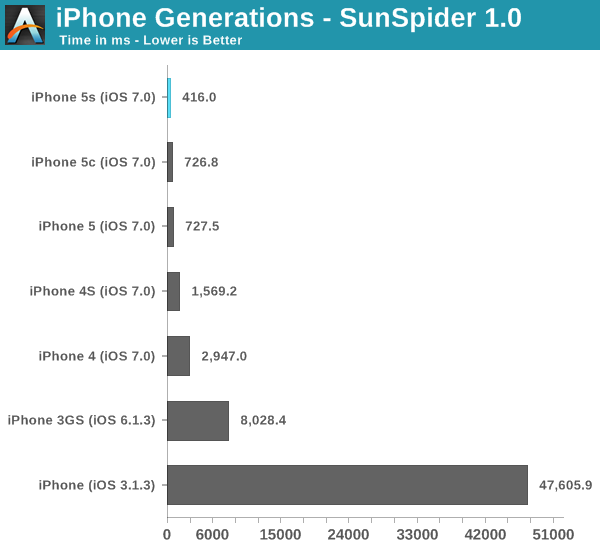 Take into account multithreaded performance and the increase over the 3GS is even bigger, almost 17x now. The only 3D test I could get to reliably run across all of the platforms (outside the original iPhone) was Basemark X. Again I had issues getting Basemark X running in offscreen mode on iOS 7 so all of the tests here are run at each device's native resolution. In the case of the 3GS to 4 transition, that means a performance regression as the 3GS had a much lower display resolution to deal with. Apple has scaled GPU performance pretty much in line with CPU performance over the years. The 5s scores 15x the frame rate of the iPhone 4, at a higher resolution too. I couldn't help but run Intel's current favorite mobile benchmark on the iPhone 5s. WebXPRT by Principled Technologies is a collection of browser based benchmarks that use HTML5 and js to simulate a number of workloads (photo editing, face detection, stocks dashboard and offline notes). 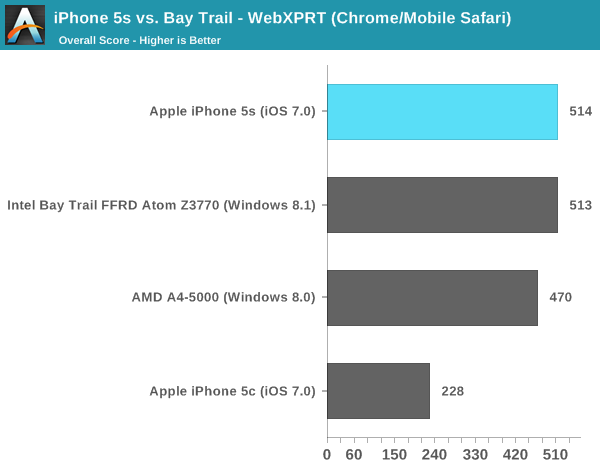 Granted we're comparing across platforms/browsers here, but the 5s as a platform does extremely well in Intel's favorite benchmark. The 5c by comparison performs a lot more like what we'd expect from a smartphone platform. The iPhone 5s is in a league of its own here. While I don't expect performance equalling the Atom Z3770 across the board, the fact that Apple is getting this close (with two fewer cores at that) is a testament to the work done in Cupertino. It's not a clean sweep for the iPhone 5s, but keep in mind that we are comparing to the best AMD and Intel have to offer in this space. I suspect part of why this is close is because both of those companies have been holding back a bit (there's no rush to build the fastest low margin parts), but it doesn't change reality.